Metal Framing Wall makes metal framing of walls fast and easy with real-time full project updates in Revit®. Plus it generates views with automatic dimensions for wall panels or segments as well as accurate bills of materials and shop drawings. So quality production and accurate assembly on site are ensured. Connectors, cuts, supports, and other details can be distributed based on predefined rules or connection types. They can then be modified or updated to suit the project design stage and the level of detail required. Wall frames and the layout of frame elements and details can be modified and updated whenever the project is changed. Dynamic update functionality can make changes to all wall frames of the same type at once. 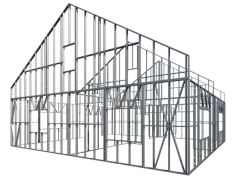 Metal Framing Wall is brought to you by AGACAD. Pricing was not known at press time.